My opinion you do not need a skirt for the east branch of the Spanish River . This trip was the first one we ever did . We had 2 canoes and I had our 9 year old and my wife had our 12 year old with her . We started at Duke Lake and paddled to the Elbow in 4 days . Besides not knowing what we were doing we didn't have or need a spray skirt . We were able to run all the rapids and had a great time . If you go past the Elbow you will have some rapids that need to be portaged but like any rapid , stop and carefully scout it before deciding that you will run or portage . Just did the east branch 1st week in July, all the rapids were run , none real challenging. We had 2, 12 year olds and 2, 16 year olds with us. I think the challenge is to view the rapids as a ski hill and get the most fun out of them! Also if you catch a lot of eddy's your chances of getting in trouble are lessened. IMO there is nothing even remotely close on the spanish to justifing a spray cover in an normal water levels anyway. If your taking on too much water there is most likely something else at play; ie boat too small, too much gear, paddling style. I would choose the west branch over the east as mentioned in above posts. Also I would take a plastic boat, not because it is a must, but simply to make the rapids more fun. 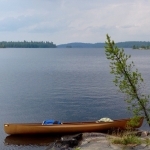 I know that I would have to portage more on the spanish with a fiberglass canoe. Paddled the west branch 2 years agowith a plasic canoe, the portaging might have added up to 50m on the west branch though we did carry gear around a couple drops after the forks in the graveyard section (which demand respect). Painter length, tips in lining, pin kits, rope tricks, zed drag, rescue knifes, scouting, a bunch of knots I should practice, paddle type/length, back forward cross, sweepers strainers holes. I would like to thank all with your contributions to various threads. I have been slowly digesting the moving water section and all of you seem to be experiencing far too much enjoyment. I'm picking a low water, less challenging month although I guess rain and dam flow from Biscotasing will have a role to play. I will definitely skip harder portions of the river and I'm marking my maps and making notes. Eyeing up a Raven for the trip.